The IITA-commissioned external review of Africa RISING East and Southern Africa project concluded on 16 March after nearly 5 weeks of literature review, project stakeholder interviews, and field visits to project sites in Tanzania and Malawi. While presenting their preliminary report at the IITA Malawi offices, the team of reviewers expressed satisfaction with the majority of the ongoing research and also called for improvements in the integrated systems research approach by partners involved as well as the strengthening of the innovation/R4D platforms facilitated by the project. 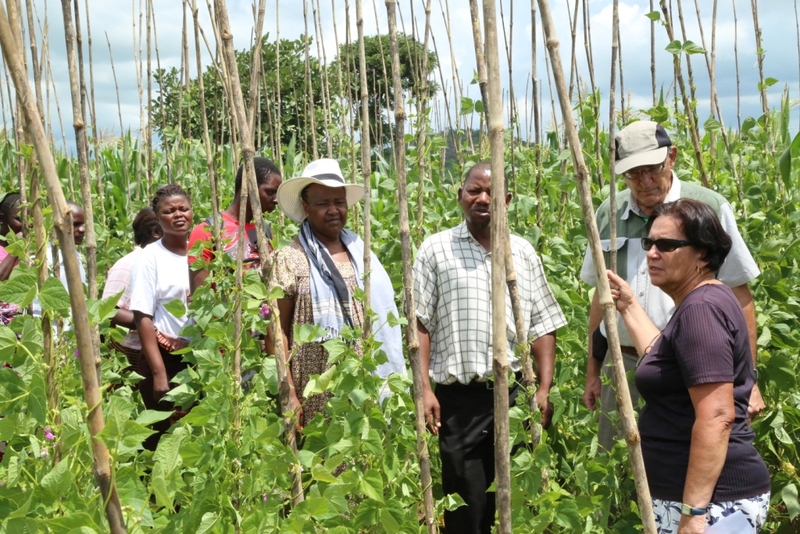 Irmgard Hoeschle-Zeledon (right), Jim Ellis-Jones (second right), Regis Chikowo (center) and Colletah Chitsike (center left) view a mother trial for climbing bean varieties in Linthipe, Malawi. Jim and Colletah were part of the team of three reviewers. The reviewers recommended a revision of some of the indicators in the project document, an update of the Africa RISING ESA logframe, a project-wide socioeconomic analysis of the technology combinations being tested and promoted as well as a stronger consideration of the gender component in all ongoing research activities. “Great progress is being made in the project especially with the biophysical research work being implemented by the scientists. Of course there are areas for improvement that we have pointed out but really it has been impressive seeing, for example, the yield increases that farmers have testified to farmers introduced by the project. We think that the next step should now be to carry out an economic analysis of the technologies being promoted to ensure that they are adoptable by farmers,” noted the lead reviewer, Jim Ellis-Jones. Another member of the review team, Colletah Chitsike gave further encouraging comments: “This project is breaking new ground in turning research into use and you have started very well. It will grow and spread,” she said. The external mid-term review had been commissioned by IITA which leads the two Africa RISING projects in East/Southern Africa and West Africa with the objective of assessing the conformity of the implemented work with the research framework developed, evaluating how the project was fostering learning by the stakeholders, assessing partnerships and project management. Results are expected to feed into the donor-commissioned program review later this year and the planning for the next project phase. “This has been a very intense review,” noted Irmgard Hoeschle-Zeledon, Africa RISING Coordinator for West Africa and East and Southern Africa, at the end of the debriefing meeting. “Thanks to everybody for being available and making contributions. We will look at the recommendations with careful interest, consult with the project donor, USAID, and see what adjustments are possible. Thank you, reviewers, for taking up the task. Your knowledge of the region was very helpful. We had a very capable team.” The final review report is expected to be ready by the end of April 2015. A corresponding review of the Africa RISING West Africa Project was conducted in September/October 2014 and the final report has been published.